The ideal alternative to a hangar! 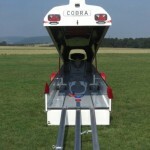 With a COBRA trailer you are always first at the starting line. Going to the airport is a pleasure, because your COBRA trailer consistently holds the road well, whether loaded or unloaded. Sailplane assembly or disassembly can be carried out with the trailer still attached to the towing vehicle. 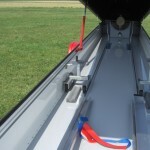 The large opening angle and the handy loading aids make it very easy to load the sailplane parts. 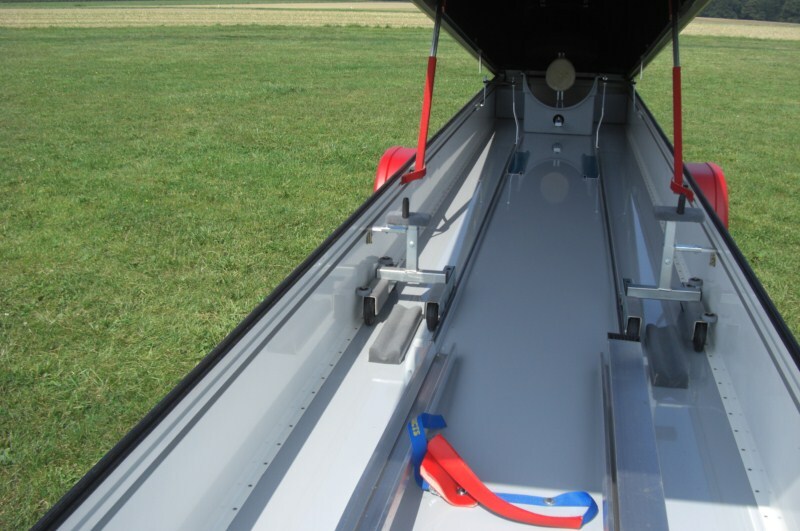 Your sailplane is safe from damage while inside the trailer. 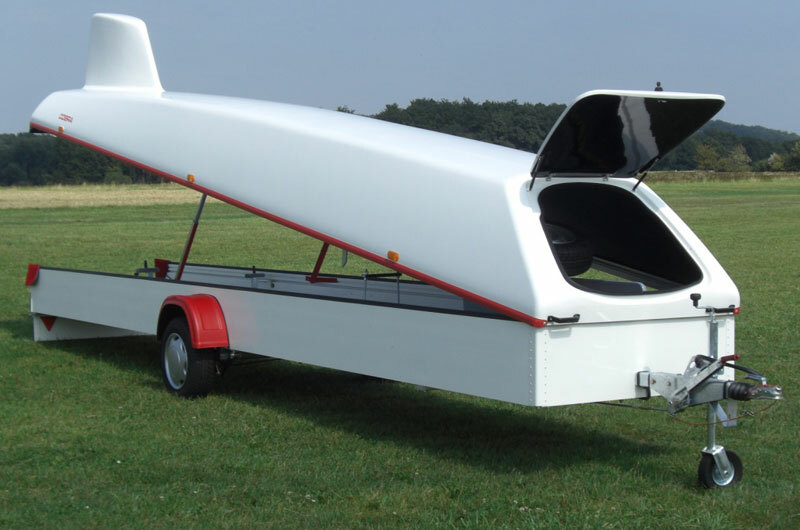 To go soaring it can be quicker to assemble your sailplane from a COBRA trailer than maneuvering it from inside a hangar. 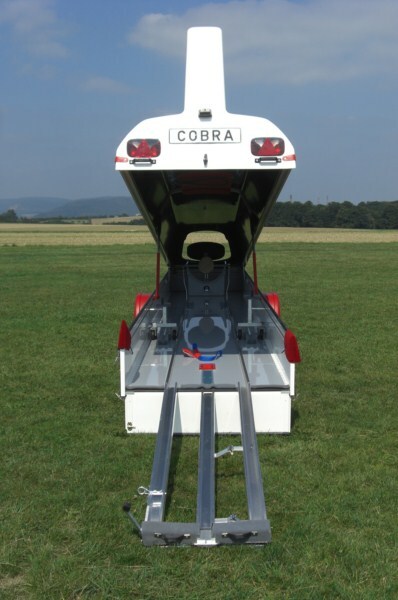 All COBRA-trailers are white to reflect the heat of the sun. You have a choice of red or blue as contrast colors for the fenders and the protective side mouldings. All exposed steel parts are galvanized. 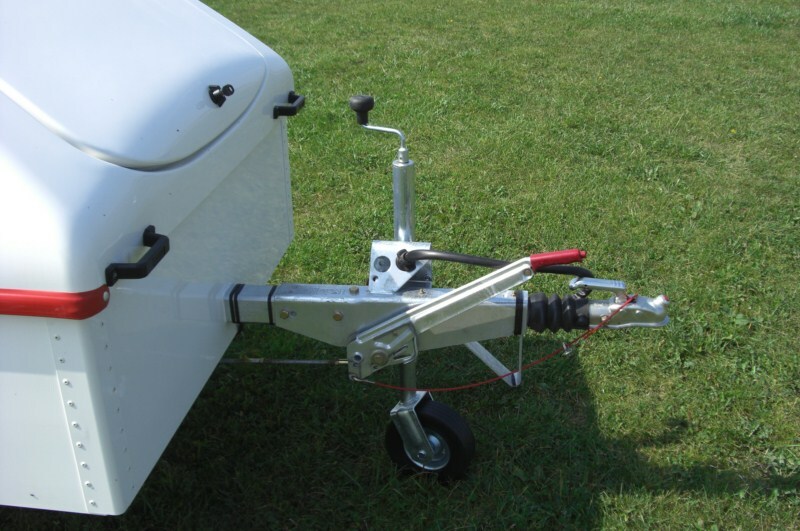 Because aluminum welds can easily fail, there are no aluminum welds in any part of the COBRA trailer. Inside the trailer you get a large box for the accessories and a spare wheel. The ramp can be used as a vehicle jack. 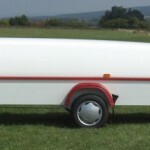 Because of its low profife, the COBRA-trailer has a low drag and is insensitive to crosswinds. The low center of gravity assures good road holding under all weather conditions. 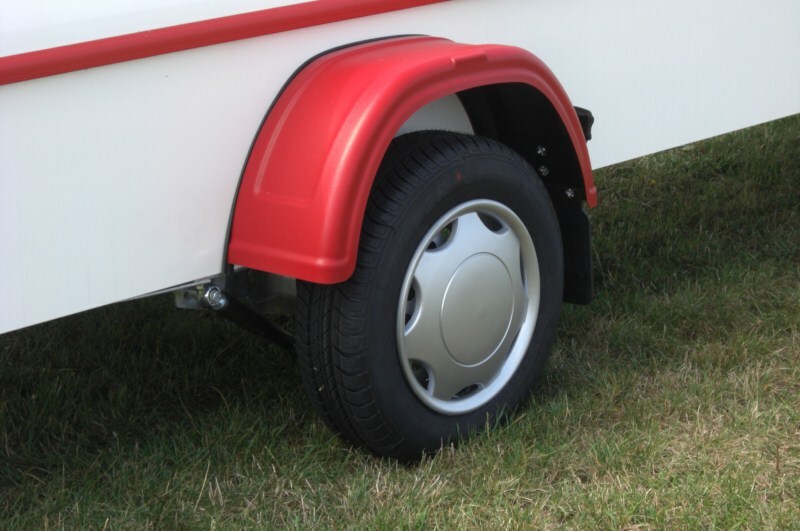 The galvanised ALKO-safety chassis is fitted with an extra-soft-spring-suspension axle, overrunning brake, parking brake, and automatic reverse gear, an extra large, stable, soft support wheel in front and high quality tires. The sides consist of one-piece double-walled, white powder-coated aluminum extrusion, with internal ribs and of a very solid alloy. This allows us to optimise the strength of the sides while guaranteeing the lowest possible weight. The one-piece aluminum sandwich floor is inserted into the two lower integral channels, bolted and riveted, providing an especially stiff and torsion-resistant construction. The strong side walls contain an integral guide for the wing dol- lies as well as a slot for the tubular rubber seal between the bottom and the top. 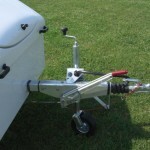 Solid tailskids protect under the rear end of the trailer from damage while towing. The tailgate is protected against scratching by a plastic top strip. Arched sides and an arched cover are the guarantee for the high stability of the elegantly proportioned top, The fin housing is drag-optimised. Adequate ventilation is provided by a ventilation slit between top and bottom to prevent condensation. The large front door hinges upward and is held open by gas springs. A protective side moulding guards against scratching. 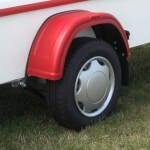 The top can be raised and lowered easily by means of telescope arms inside the trailer. Two versions are avaifable: a one-piece fibreglass sandwich top with an aluminum frame, or a monocoque of powder-coated, painted aluminum sheet which is riveted and bonded water-tight.